Found this girl prowling around one of our out buildings at night. We see opossums and raccoons all the time but even though it was dark this one seemed very light colored. As I got closer I saw it was a white one! Grabbed it by the tail and took pics the next day. 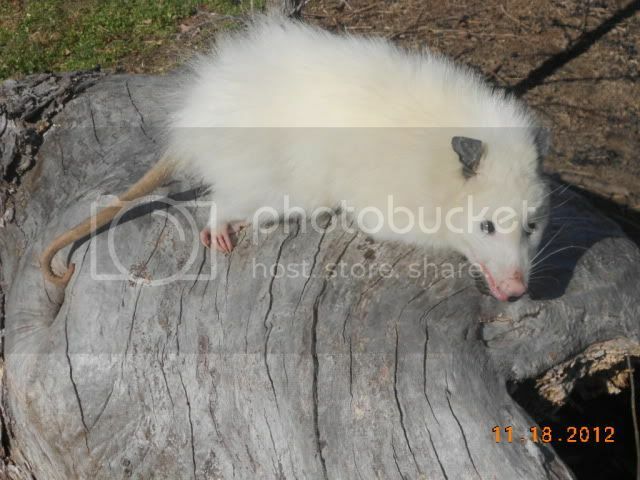 I had seen photos before but this was my first leucistic opossum! It will be interesting if we see this one again since there are about 3 different opossums I see a lot. Didn't have much luck posing in a tree. I really wanted a natural looking pose. Finally had to settle for the old hand held pic! Anybody really know how rare they are? Big sucker, too. That's probably the only good looking opossum to have ever existed. Wow, that's a cool looking animal! It also looks pretty docile, don't those things bite? I guess any leucistic animal that size would be very rare, partly because they would be very vulnerable to predation and not live long enough to pass on their genes. Cool find! And despite there dopey appearance I have always enjoyed seeing Opossums. mrichardson wrote: It also looks pretty docile, don't those things bite? Personally, I wouldn't go picking on up, if for the low rabies potential alone, but they usually are pretty mellow and sluggish. They rely more on bluff and intimidation that actual attacking. That said, they have MANY sharp teeth and can bite. 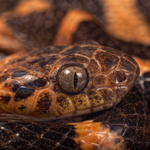 Aside from how many die on the roads, it is amazing they survived predators long enough to colonize much of the US. 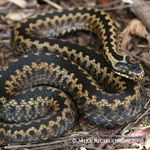 Andy Avram wrote: That said, they have MANY sharp teeth and can bite. Aside from how many die on the roads, it is amazing they survived predators long enough to colonize much of the US. 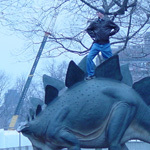 Homer J Simpson wrote: I call the big one "Bitey". Seriously though that is pretty cool. Do people ever domesticate these things as pets? Kinda strikes me as the sort of critter that has the potential to tame down into a cool domestic (compared to some of the crazy mammals people keep at least). tai haku wrote: Seriously though that is pretty cool. Do people ever domesticate these things as pets? Kinda strikes me as the sort of critter that has the potential to tame down into a cool domestic (compared to some of the crazy mammals people keep at least). The average lifespan of a wild one is about 18 months, in captivity they MAY make it past 3 years. Just don't live long. 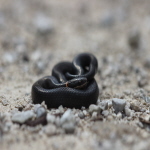 They are commonly used by local wildlife centers as program animals, but it doesn't mean people don't get bitten by them either. We usually have a couple on staff at my work. Just wanted to say I would not recommend holding a wild opossum because they can bite but usually do not. And as Andy Avram said the rabies risk is always there with a wild animal. Hard to get a good take or feel on them also because they are so mellow and that makes them seem rather unintelligent. Interesting that they have such a short life span! That is amazing. Never seen a white one! 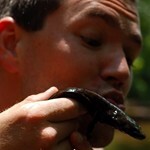 I have raised a couple up at the Zoo that were very dark, almost melanistic. They didn't have the usual silver guard hairs, but instead were all black with a grayish face. My favorite one was named Johnny Cash- he was 'the Possum In Black'. Ha ha! 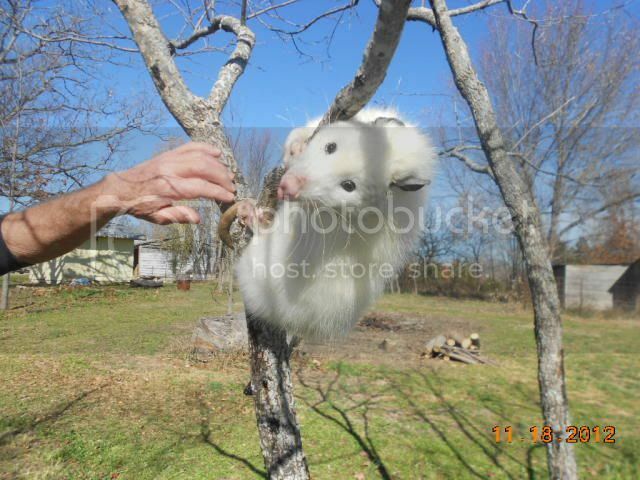 I kept a leucistic opossum for a sort of pet for awhile. It never did tame down but it was the prettiest possum I have ever seen. Neat pictures. Mine was a Florida possum. Ordinarily I'm not very fond of opossums (they used to do a great job of messing with my live traps for small carnivores), but that critter is beautiful. Thanks for sharing it with us! Haha, that's awesome! They're too funny. 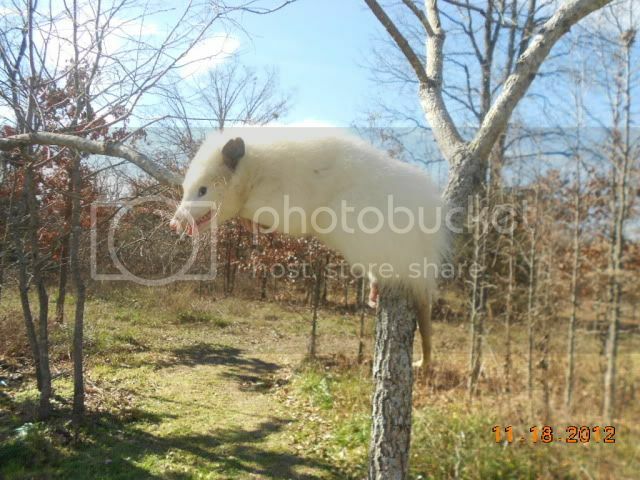 I've seen a lot of opossums but never a white one. Where I lived as a kid, all of the opossums were either white or silver. It wasn't until I moved up here that I realized that that's not normally the case. May I ask where this was found? 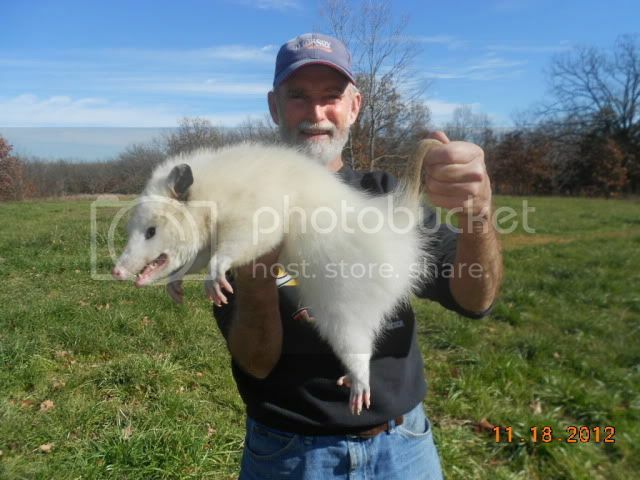 Ted Tuchak wrote: I kept a leucistic opossum for a sort of pet for awhile. It never did tame down but it was the prettiest possum I have ever seen. Neat pictures. Mine was a Florida possum. Thanks Ted and welcome to the forum! Tamara, Gerry, PrimitiveTim, thanks for the comments! 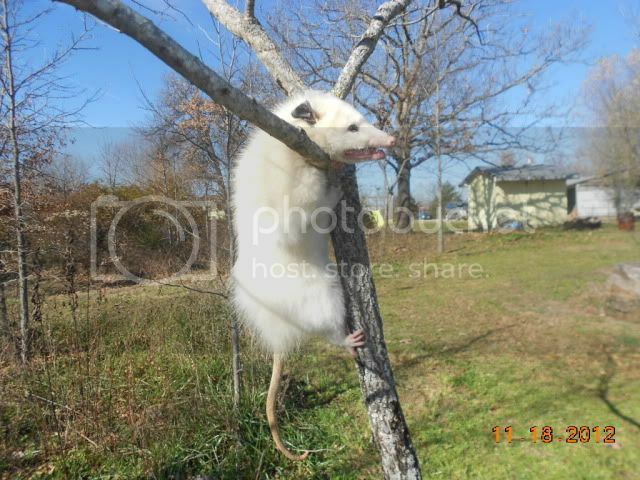 Joshua Jones wrote: Where I lived as a kid, all of the opossums were either white or silver. It wasn't until I moved up here that I realized that that's not normally the case. May I ask where this was found? Found in South central Missouri. Thanks for bringing this old post up again. It really was a beautiful animal. I had slim hopes I would see it again but hasn't happened. I realize that this thread hasn't been active in a while, but I wanted to share the only color video we have (so far) of the leucistic female Opossum which began to visit our property in May, 2015. We are located in SE Wisconsin and would be interested in learning about other sightings of leucistic Opossums. In general, we are wondering if leucism is more prevalent in certain geographic locations. Wow critter farm, that is a massive one. Great post guys!! Quite interesting, my only notable opossum observation was a dor I found in corn springs while doing field work about 15 years ago. Have never seen another in the desert.